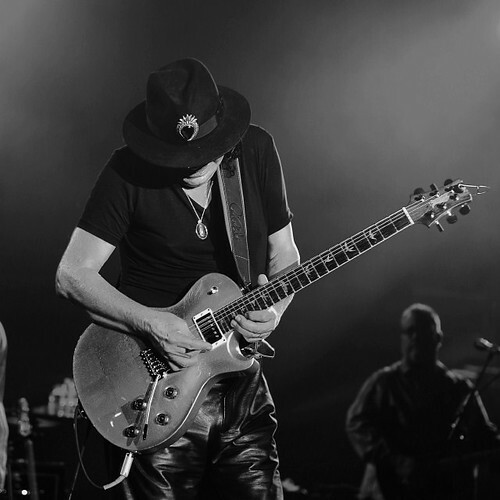 We catch up with international award-winning rock photographer Eddie Sung, who has clocked rock gravitas having shot Metallica,Guns N’Roses and now Santana since the year began. We find out why this concert is different and enjoyable for him. 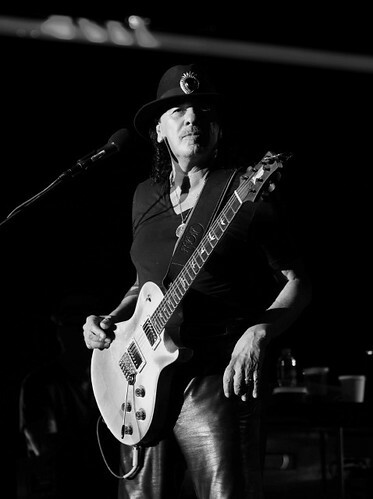 Q – We understand you’ve shot Santana concerts before? 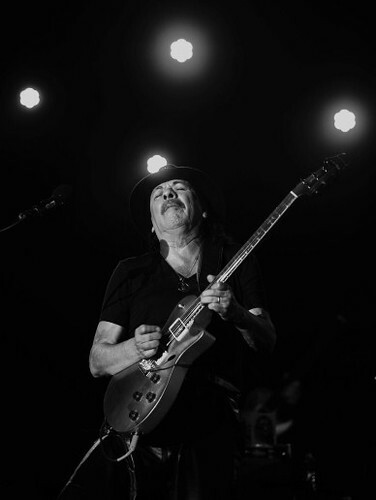 The recent Santana concert held on April 4th 2017 is the fourth time I got to hang out and shoot Santana concerts.I was allowed to shoot for the entire concert, not just for the usual first three songs. 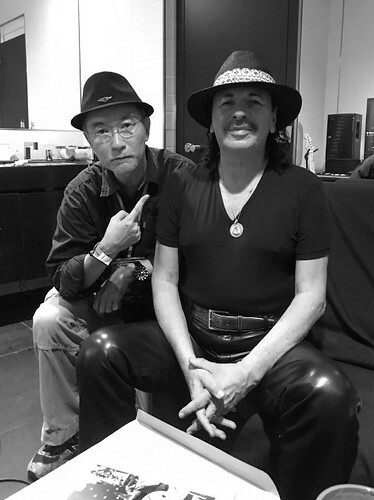 Once in 2008, I went with Steve Wozniak (Apple co-founder) backstage to meet Carlos. They were already friends from the 70’s. 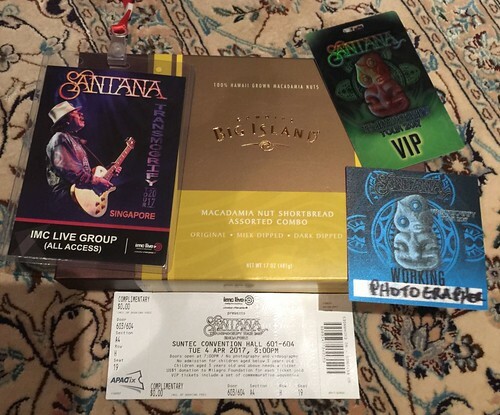 I thank Libby Fabro, Santana’s tour manager for granting me the privileges. He bestowed on me, enough concert passes to be able to float around without being accosted by security. What’s cool is he also gave me a box of yummy Big Island macadamia nut cookies for my family! Malahos, Libby! 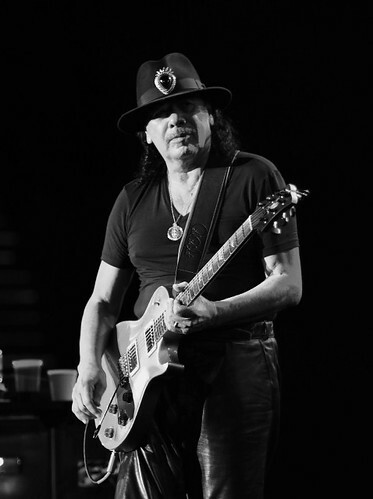 Q- How is Carlos Santana different from other guitar virtuoso? 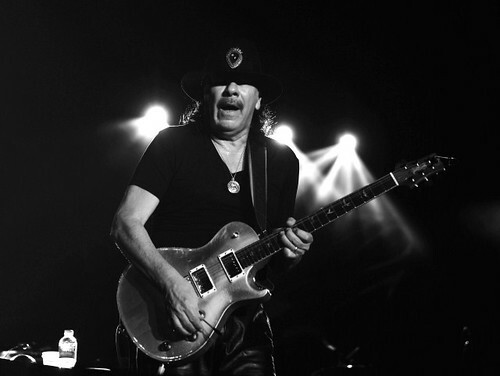 Shooting Carlos Santana is always fun because he seems to always be at One with his signature PRS guitar. It’s always great to photograph Carlos in his Zone. I thank Carlos again, for allowing me to do my usual B/W Stage Portraits of him. 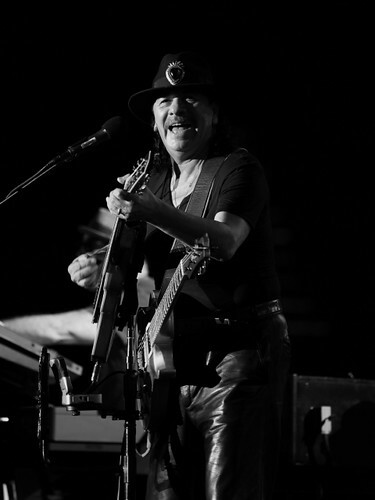 Q- What do you look forward to at a Santana concert? Well, I go early to hang out backstage. I get introduced to the senior tour and security crew whom I met previously. It’s fun to catch up with all of them. When Carlos is finished meeting his guests (organisers and VIPs), it’s my turn to hang out. 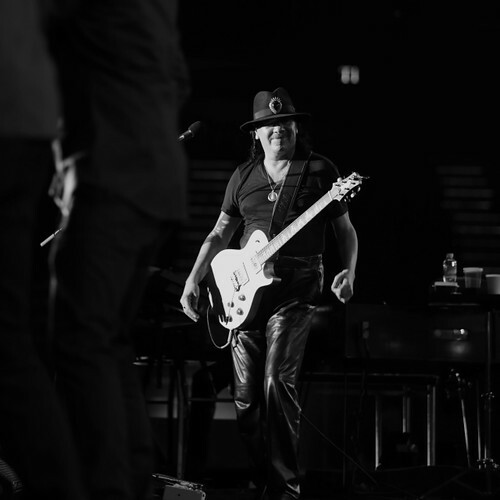 After the above image was taken, a brief moment later, Carlos and band went to the stage to mesmerise their patiently waiting fans. 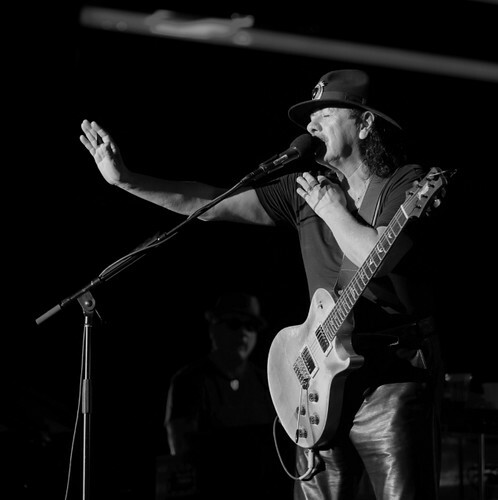 Q – Is this concert the same or different from the previous ones you shot? This time, I got to know Carlos’ beautiful and talented wife, Cindy Blackman Santana. 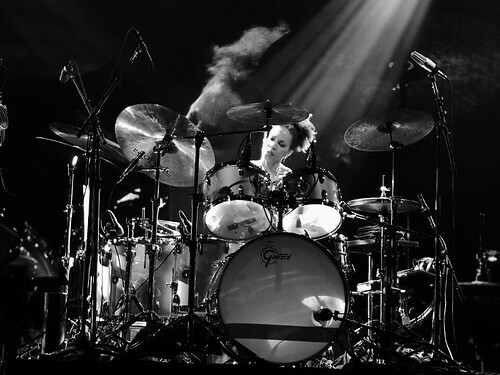 Cindy is an accomplished jazz drummer and provides the crucial backbeat to the rich Santana percussive soundscape. 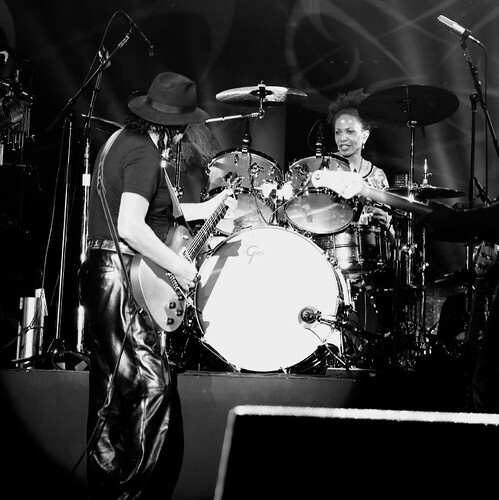 She emailed me, thanking me for my beautiful images – from current and previous concerts. Cindy posted the above image on her Facebook entry on the Singapore concert. Cindy liked the above image, and will be using it as a publicity shot for her solo live gig materials. 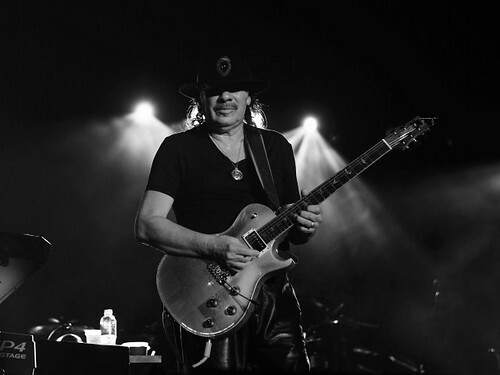 Q – What was hanging out with rock legend Carlos Santana like? 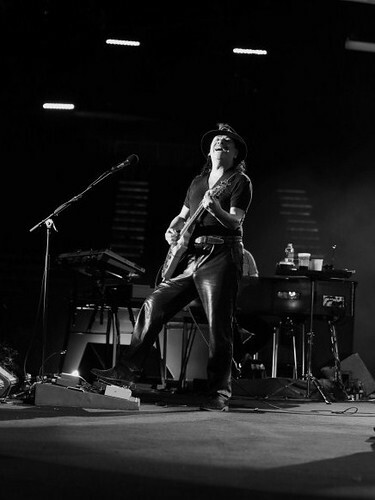 He’s the coolest dude in the room, in fact, in the concert hall. Haha. 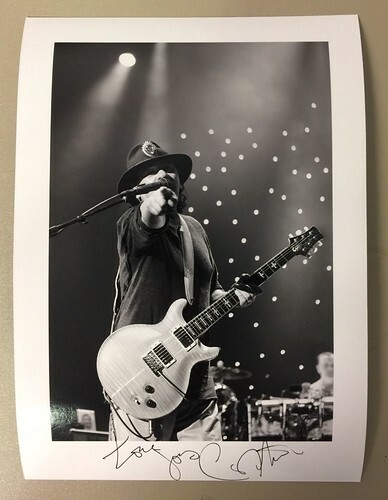 He kindly signed my print of him pointing at me from a previous concert. I also presented some signed prints to him and his wife Cindy. 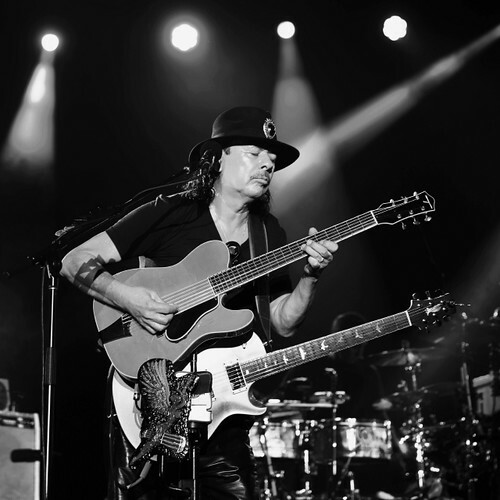 Q – What are the highlights of shooting a Santana concert? First, I love the songs – Black Magical Woman, Samba Pa Ti, Oye Como Va, Jingo, Evil Ways, and Soul Sacrifice. 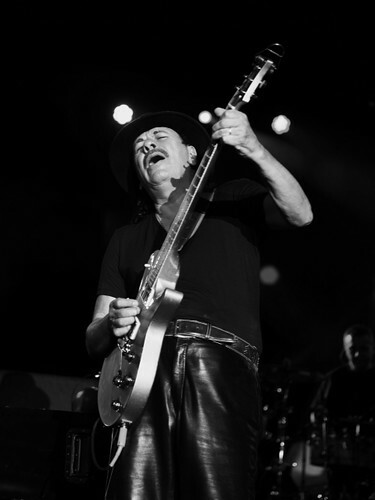 So it’s a supreme pleasure to shoot the entire concert with my favourite Santana songs blasting away. Visually when Carlos becomes one with his guitar, he goes into this Zen state, immersing himself totally into this “trance”. I do take time to put my camera aside, to just enjoy the music. I’m usually park myself on the side of the stage, not blocking people in the front row. I appreciate it when artistes feel comfortable with my presence and camera. They start to have fun with my lens. Know that I’m capturing all the visual gifts they throw at me. This being the fourth show, I’ve shot, I’d like to think that he knows my B/W style of shooting by now. Light-hearted visual moments, shared with the Maestro! Carlos is a spiritual man; he brings spirituality to his performance. The relentless Preacher of Peace. In troubled times, he brings a welcome healing to the show. As per image below. Carlos unleashes his guitar prowess, his unique guitar sound. A pure Master of his Instrument and Craft. Emotional & Effortless. 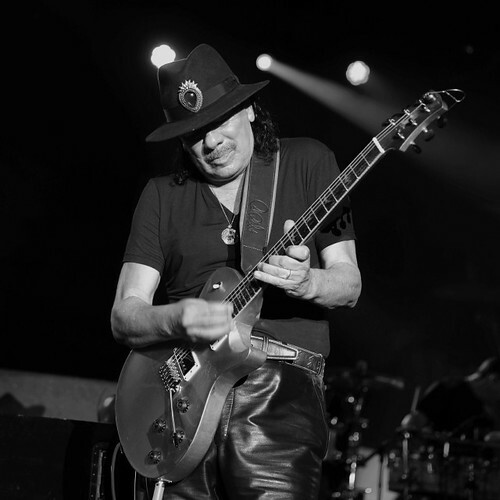 Decked out in complete black – hat and clothes – Carlos resembled a seasoned gun slinger! Carlos in a state of Zen with the stars. I must also mention how tight Carlos’ band members were. 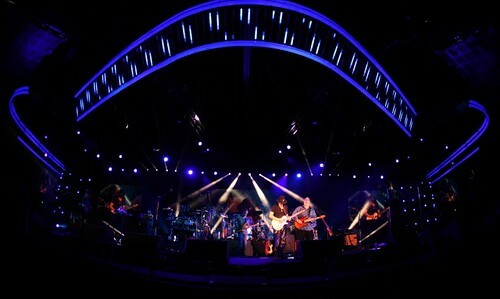 I like this fish-eye image with all the band members. Bracketed by the awesome ceiling stage structure.